CIR has over 15 years of experience conducting habitat restoration projects and erosion control projects on the Channel Islands and the coastal areas of Southern California. CIR has worked on 28 projects on the Channel Islands. 63 projects on the coastal areas of Southern California mainland. Our clients include 4 federal agencies, 6 state agencies, 9 local or tribal agencies and 15 private entities. We have worked with more than 10,000 volunteers, 3,200 of which were students from underprivileged schools. Click a location name below to read more about our work there. As our name suggests, we do a lot of habitat restoration on the Channel Islands. What began as a duo removing invasive eucalyptus on Santa Cruz Island in 2002 has grown to work on all eight Channel Islands with the help of dozens of new staff and thousands of community volunteers. Our eventual expansion on to the Central Coast mainland enabled us to take on dozens of new projects. CIR worked with the Santa Barbara Zoo and the City of Santa Barbara to restore a section of the Andree Clark Bird Refuge on zoo property. Operating under funding from the Southern California Wetlands Recovery Project, CIR removed over 100 invasive Myoporum trees, plus cape ivy (Delairea odorata) and many other invasive species. We also planted several hundred native species at the restoration site with the help of over 250 volunteers! Working under contract for the County of Santa Barbara Agricultural Commissioner's Office, CIR has treated many stands of Arundo donax in Hidden Valley Park & other extensive areas along the Arroyo Burro Creek in Santa Barbara. 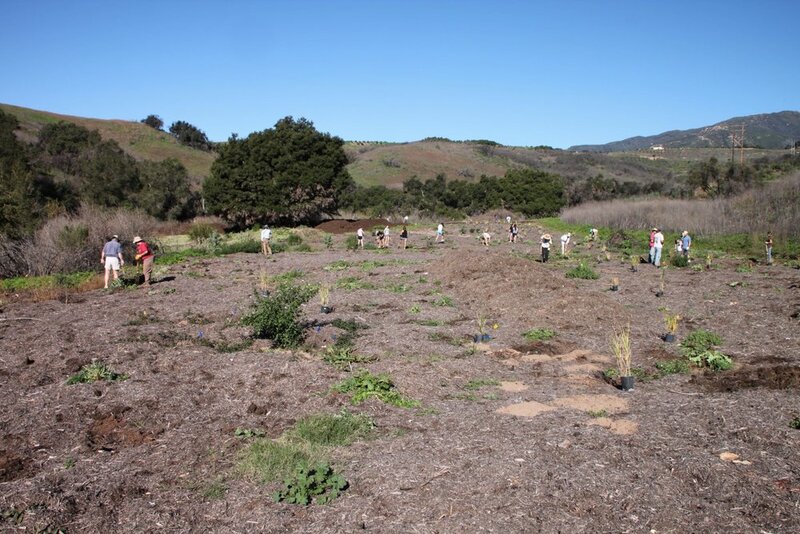 CIR has performed extensive invasive plant removal projects for the Land Trust of Santa Barbara County on the Arroyo Hondo Preserve on the Gaviota Coast. Our work at the reserve takes place in close proximity to several listed/threatened/endangered species including southern steelhead trout, red-legged frogs, and tidewater goby. 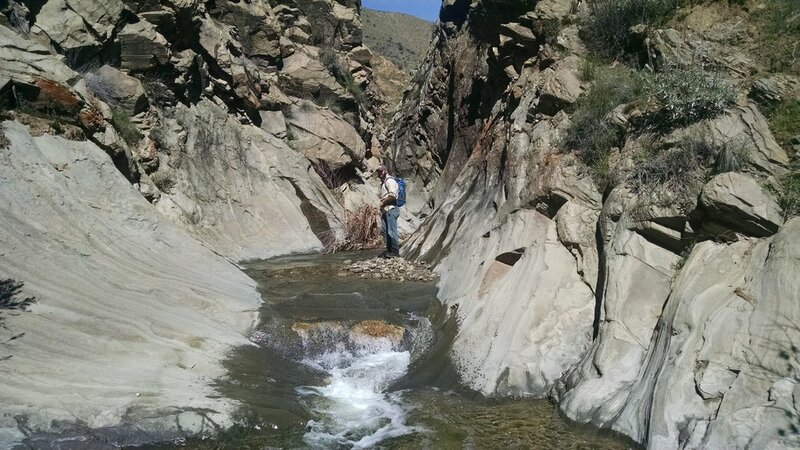 CIR is trusted to perform careful and professional work in highly sensitive habitats at Arroyo Hondo. 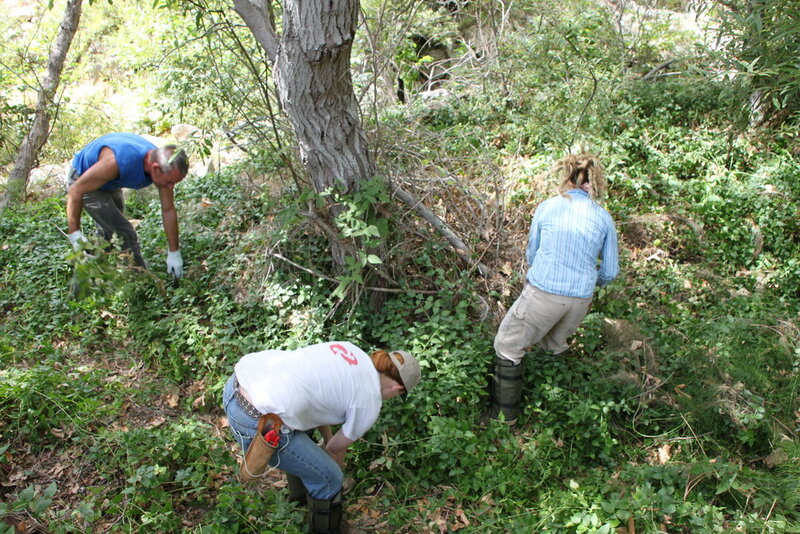 For more than 10 years CIR has worked at the reserve removing invasive trees, periwinkle (Vinca major) and onion weed (Asphodelus fistulosus). Photo of an El Segundo Blue Butterfly on Seacliff Buckwheat by Flickr user Stonebird. Our Senior Ecologist conducted a botanical survey of an abandoned road on the Burton Mesa Ecological Reserve and then prepared a Habitat Restoration Plan for the road. The survey and plan were prepared for the California Department of Fish and Wildlife and the U.S. Fish and Wildlife Service in 2016. The purpose of the plan is to restore and enhance habitat that is suitable for the El Segundo blue butterfly (Euphilotes battoides allyni), a federal-listed endangered species. The entire life cycle of the El Segundo blue butterfly is closely tied to seacliff buckwheat (Eriogonum parvifolium). The project site is located in northwestern Santa Barbara County, California within the Burton Mesa Ecological Reserve. A CIR Field Technician plants Stipa pulchra. In fall 2015, we collected seeds from Eriogonum parvifolium from a site about 400 meters away on the Burton Mesa Ecological Reserve, and in late spring 2016, we collected seeds from Stipa pulchra, Melica imperfecta, and other species from the project site itself. Our Nursery Manager and Nursery Technician, with help from volunteers, propagated plants from the seeds we collected in our native plant nursery in Camarillo. In January 2017, we cleared areas of an abandoned dirt road that were dominated by annual grasses and installed more than 200 native plants and an irrigation system. The plants are thriving, and we are continuing to maintain the site. Working with the County of Santa Barbara, Channel Islands restoration supervised the removal of giant reed (Arundo donax) from a two-mile stretch of Carpinteria Creek. During the length of the project, CIR removed 42 tons of Arundo from the creek. CIR worked in partnership with South Coast Habitat Restoration, Carpinteria State Beach and the Carpinteria Creek Coalition (with funding provided by the Southern California Wetland Recovery Project) on an innovative project to remove iceplant at the foot of Carpinteria Creek at the State Beach. CIR staff and volunteers first "solarized" the iceplant (eradicated it by placing sheets of black plastic over the iceplant thereby heating it and depriving it of light). Then, while leaving the dead iceplant in place, CIR staff and volunteers installed nearly 2000 native plants after the plastic was removed. CIR has a longstanding association with the Cheadle Center for Biodiversity and Ecological Restoration (CCBER) at Coal Oil Point Reserve on the Goleta Coast. 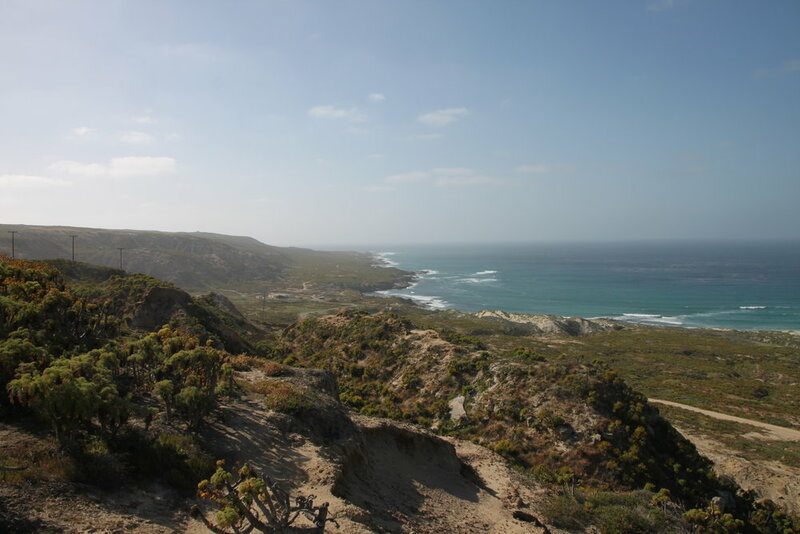 Coal Oil Point Reserve is one of many open spaces preserved and managed by the UC system for the purposes of research. CIR has conducted dozens of important and extensive invasive tree and shrub removal projects on the reserve over the last decade and we are proud to continue to collaborate with CCBER and UCSB on the preserve. Braunton's Milkvetch growing in the Camarillo nursery. A CIR Field Technician installs the endangered plant. A population of over 100 individuals of Braunton’s Milkvetch (Astragalus brauntonii), an endangered species, was found on a site after the site had been approved for development of new homes. In order to avoid impacts to this endangered species, at the request and with the permission of regulatory agencies, in February 2017, our crew dug up and took the plants to our native plant nursery in Camarillo, where we transplanted them into nursery pots mixing the native soil with a potting mix. After we dug them all up, we used a bobcat to scrape the surface of the soil where they had been growing in order to capture the seed bank, and then we spread that soil out on the site where the plants will be planted. We proceeded to take care of the transplanted individuals through the spring, summer, and fall in our nursery. We will plant them on a nearby site, authorized by the agencies, that is owned by the Conejo Open Space Conservation Agency (COSCA). There, we will set up an irrigation system, water them and weed around them until they are well established. Nursery Manager Kelle Green holds milkvetch grown in her Camarillo nursery. CIR has treated Pampas grass in Elings Park in Santa Barbara. Much of this work has occurred in very rugged terrain, and the plants were growing directly with native coastal sage scrub plants. We have and are currently restoring native plants to the vacant areas. Kevin Thompson sprays weed-killer onto the artichoke thistle. CIR is worked with the County of Santa Barbara Agricultural Commissioner's office to eradicate artichoke thistle (Cynara cardunculus) on the Gaviota Coast. Artichoke thistle is a difficult-to-remove invasive weed that is very destructive to native habitat. CIR is working with many project partners to preserve and manage the native coastal habitat of the Hammond's Meadow Open Space, known as the Chumash village Shalawa. Visit the Hammond's Meadow Project web page for more info. CIR treated invasive (including Arundo donax) at the Hendrick Ranch Nature Area on the Santa Clara River. We worked in partnership with Coastal Restoration Consultants. From 2009 to 2011, CIR restored sites along Los Carneros in Goleta. With funding from the Goleta Valley Land Trust, the project involved removal of key invasive plant species from the perimeter of the lake followed by revegetation of the area with native plants. More than 350 volunteers helped with the various stages of restoration. The project emphasized community involvement and education, and enhances important bird habitat and directly benefits Santa Barbara honeysuckle (a species of special concern.) We are proud to have worked closely with the City of Goleta on this project. Channel Islands Restoration removed a massive stand of giant reed (Arundo donax) from the hillside of Lookout Park in Montecito. We planted native coastal shrubs to create habitat but also allow for ocean views from the park. With the Arundo now gone you can actually look out onto the ocean from Lookout Park. Our field technicians are specially trained for projects involving herbicides or in sensitive areas. This project includes both scenarios. CIR is working with ARCADIS US to restore habitat near McGrath State Beach in Oxnard. The project includes wetland creation and dune enhancement on two parcels totaling nearly 30 acres. A major aspect of the project is the protection of the Ventura marsh milkvetch (Astragalus pycnostachyus var. lanosissimus), an endangered species that grows on the North Shore site. The milk-vetch was thought to be extinct until a small population was found growing at the North Shore site. 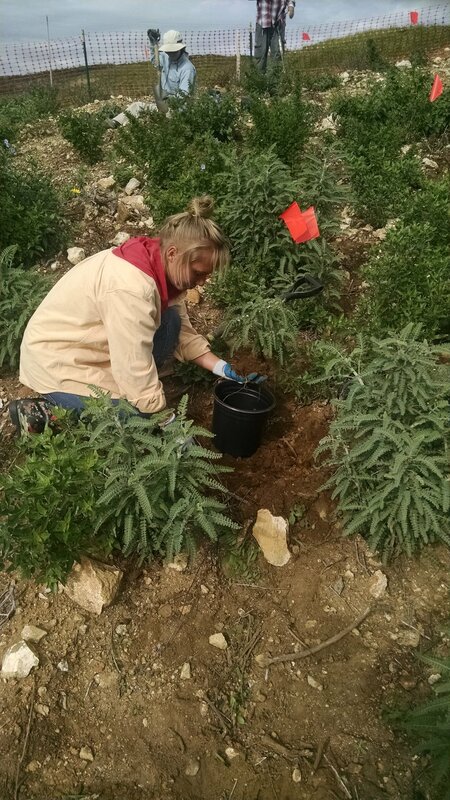 CIR staff carefully removed invasive plants that are threatened the endangered milk-vetch. CIR treated Arundo donax in rugged terrain in Mission Canyon near the Santa Barbara Botanic Garden. CIR has removed multiple large stands of Arundo donax under contract with the Montecito Fire Department at various locations along creeks in Montecito. CIR has worked under contract with the Santa Barbara County Agricultural Commissioner's office to eradicate Papas grass (Cortaderia selloana) and Russian knapweed (Centaurea repens) at various locations on More Mesa in Goleta. We have also conducted some erosion control measures for the Homeowners' Association by utilizing field staff trained in rappelling. CIR worked under contract with The Nature Conservancy to eradicate Myoporum trees and iceplant at Ormond Beach in Oxnard. CIR has worked under contract with the City of Santa Barbara Parks Department to remove several invasive species in Parma Park. Our work has involved careful invasive eradication in native plant communities. CIR is helping several agencies to remove non-native vegetation and to plant natives at Peck Park Canyon in San Pedro as part of a larger project. Peck Park Canyon is a 31-acre corridor located within Peck Park. The project includes erosion and sediment control, flood control and water quality improvements through the infiltration of stormwater. 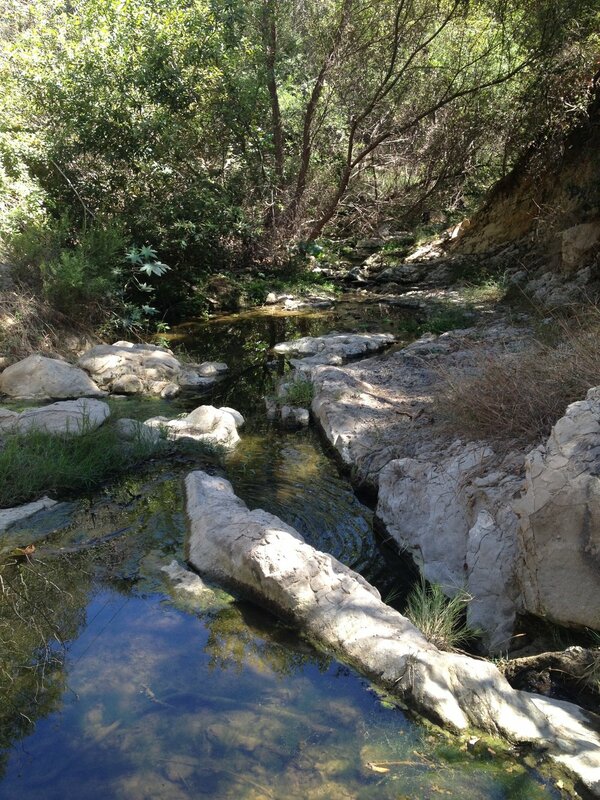 CIR’s work focuses on high priority locations in the canyon streambed. From 2006 to 2009, CIR worked to remove Arundo donax from Refugio Creek above the campsite and beach. CIR worked in cooperation with The Land Trust of Santa Barbara County, the Cachuma Resource Conservation District, and the Santa Barbara County Flood Control District. Removing at least 100 separate patches, on 4 acres, of Arundo donax, as well as several smaller areas of other invasive plant species detrimental to the wildlife ecology of Refugio Creek. Stabilizing the creek bank on over one mile of Refugio Creek to reduce the chances of large-scale bank failure, future sediment deposition into the creek, and bank-cutting that undermines riparian vegetation and habitat values and threatens high-quality orchard land. Re-establishing native riparian habitat on 17,000 square feet along the creek corridor by planting more than 3000 trees, shrubs, and herbaceous annuals. These plantings stabilized the creek banks, created shade to cool and conserve water in the creek and provide excellent habitat for a wide array of local wildlife. Conducting three years of post-installation monitoring, re-treatment, and replacement planting to ensure a successful outcome. Demonstrating a model for collaboration among private agricultural landowners, government agencies, and non-governmental organizations to address watershed enhancement on the Gaviota Coast. CIR worked with ARCADIS US to restore portions of the Rice Ranch area in Orcutt. Kevin Thompson teaches volunteers how to properly apply organic weed-killer. CIR worked in close cooperation with the Santa Monica Mountains Trails Council and the Santa Monica Mountains National Recreation Area to eradicate Spanish broom (Spartium junceum) at Saddle Peak in the National Park. CIR staff trained volunteers in eradication techniques and helped supervise volunteers. 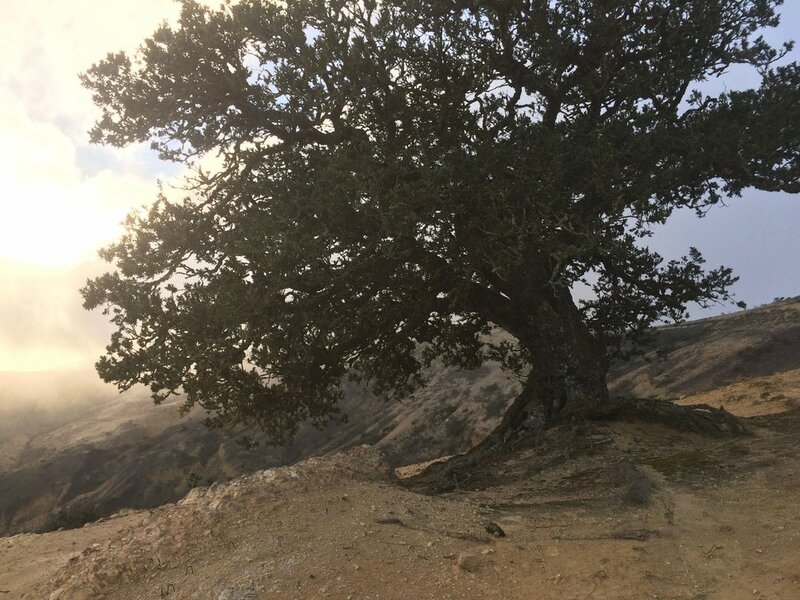 Since 2010, Channel Islands Restoration (CIR) in partnership with the San Marcos Foothills Coalition (SMFC) has restored habitat for native animals in several critical areas on the Preserve. Financial support for these projects came from the SMFC, the Goleta Valley Land Trust and outdoor retailers, REI and Patagonia. These projects were designed to improve the native plant communities that support species such as burrowing owls, breeding grasshopper sparrows, breeding white-tailed kites, raptors, and other native animals. Two of the larger projects were designed to increase biodiversity and ecological function on approximately three acres of burned riparian and coastal sage scrub habitat adjacent to Atascadero and Cieneguitas Creeks. Long-term grazing in these areas favored the growth of non-native and invasive plants, and the area was damaged by the Jesusita Fire in 2009. Following the fire, both sites saw a marked increase in the presence of non-native invasive plants. CIR started by removing invasive plant species with the help of hundreds of volunteers, and this was followed by the planting of more than 4,700 native plants grown from locally collected seed. In addition to the creekside projects, CIR has been removing invasive plants along trails, particularly in native grassland areas and wetlands. We have also planted natives at the Preserves' Via Gaitero entrance. As of this writing (August 2015), CIR has worked with a total 1,319 volunteers on the San Marcos Foothills Preserve! CIR treated several large stands of Arundo donax on San Roque Creek under contract with the County of Santa Barbara. CIR worked under contract with the Santa Barbara Botanic Gardens. We have treated several key invasive around sensitive native plants in the garden. 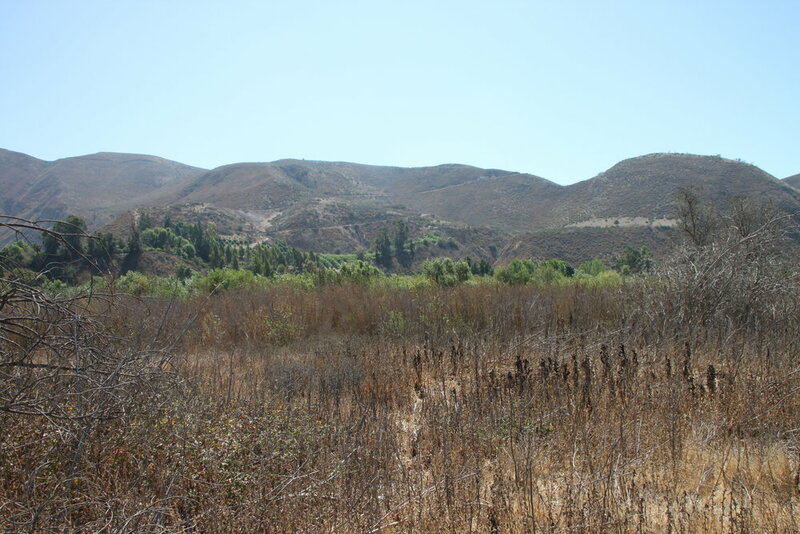 CIR collaborated with BioResource Consultants to restore 5 acres of habitat on the Santa Clara River near Santa Paula as a mitigation measure for the City's new wastewater treatment facility. The project created and enhanced riparian habitat to increase wildlife diversity, including the southwestern pond turtle. CIR has treated giant reed (Arundo donax) at three properties on the Santa Clara River owned by the Nature Conservancy (TNC). We continue to work on TNC property in partnership with Coastal Restoration Consultants. In 2016, we prepared an Invasive Species Treatment Plan for the Santa Ynez Band of Chumash Indians. 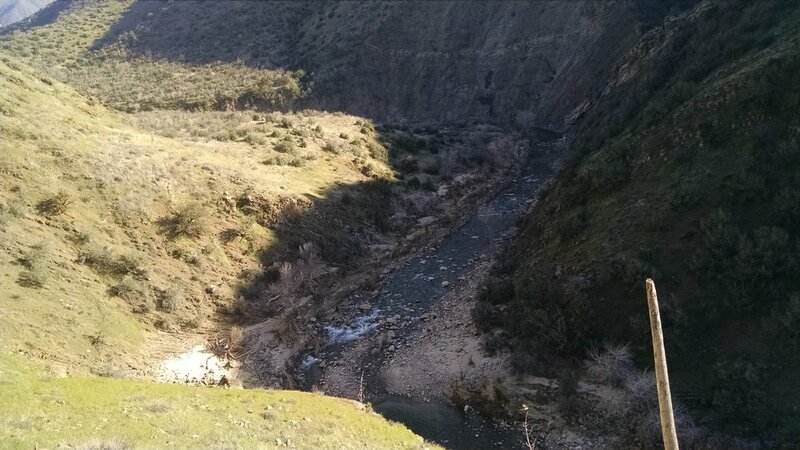 The objective of the plan is to describe methods of controlling non-native invasive plants occurring in Zanja de Cota Creek. 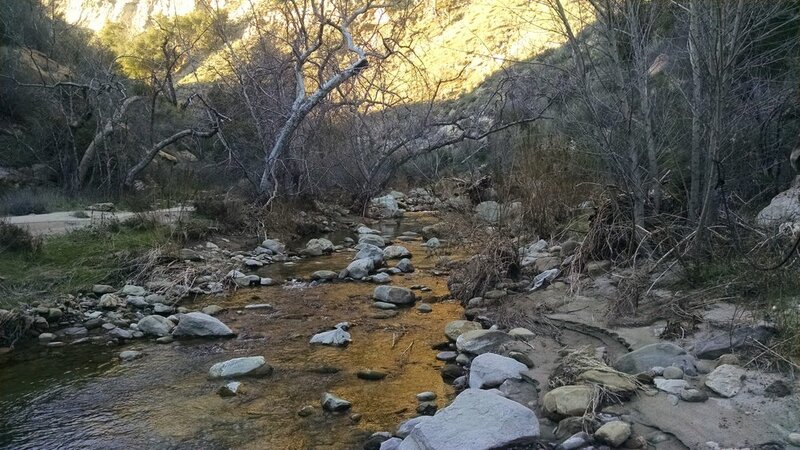 Zanja de Cota Creek is a tributary to the Santa Ynez River, joining the river approximately 2.25 miles south-southwest of the town of Santa Ynez. It has its headwaters northeast of Highway 154 and then flows south for approximately 4 miles. It flows through the town of Santa Ynez and through roughly ¾ of a mile of the Chumash Reservation as an ephemeral stream and becomes perennial upstream of the river. The downstream section of the creek supports lush riparian vegetation downstream of the wastewater treatment plant consisting of dense willow strands, black walnuts, California blackberry, and many other species. The creek supports 161 species of plants, of which, 90 to 93 (about 57 percent) are non-native. The plan describes the origins, ecosystem threats, biology, and control methods of the five species that are the highest priority for eradication. These species are Himalayan blackberry (Rubus armeniacus), Bigleaf Periwinkle (Vinca major), Giant Reed (Arundo donax), English Ivy (Hedera helix) and Common Eucalyptus (Eucalyptus globulus). We followed this up with the first round of successful treatment in spring 2017 and will be following that up with additional treatments in 2018. 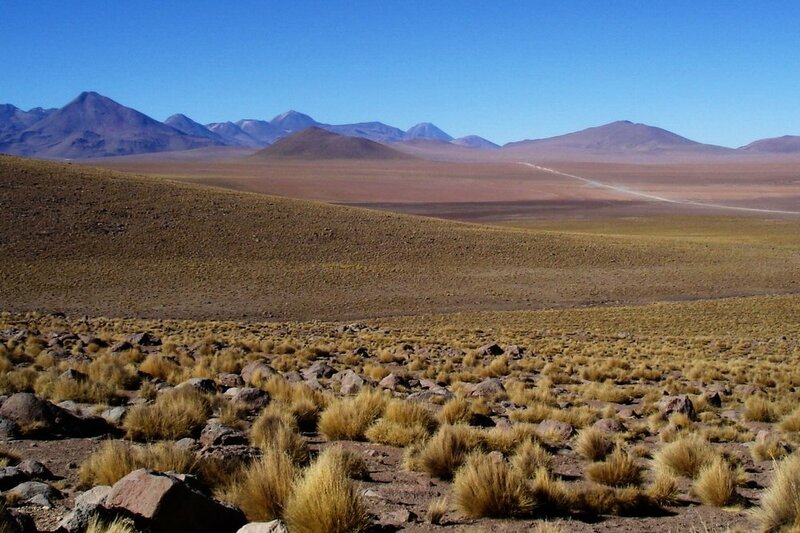 We do not have a photo of this, so instead please enjoy a photo of a puna grassland in its native Chilean habitat. Note the differences between our ecosystem and this one. Photo taken by Roman Bonnefoy. Used with Creative Commons Liscense www.romanceor.net. CIR worked in partnership with the Santa Barbara County Agricultural Commissioner's office to eradicate an infestation of puna grass (Acnatherum brachychaetum) located on a horse ranch on Happy Canyon Road in Santa Ynez. Puna grass is an "A" rated noxious weed and is a tough, spiky bunchgrass that interferes with harvest machinery, and horses and cattle find unpalatable. Channel Islands Restoration is working to eradicate non-native invasive Tamarisk species in the Sisquoc River and Manzana Creek. The objective of the project is to restore and maintain habitat for riparian-dependent species such as the federally listed arroyo toad, California red-legged frog, and steelhead trout. 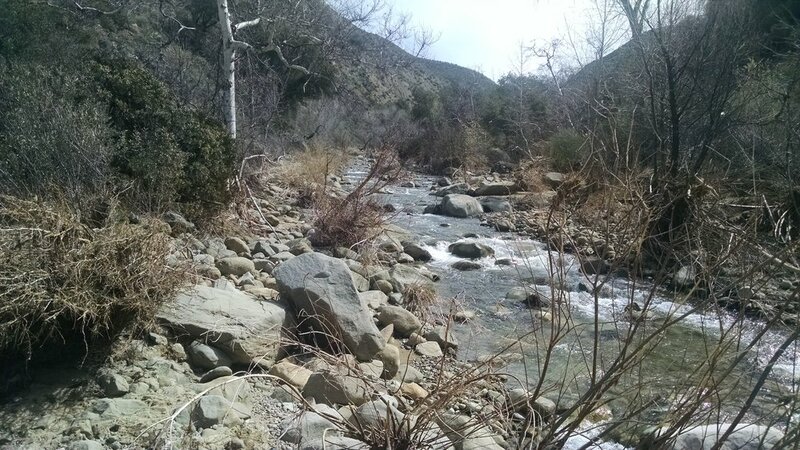 The project is located within the Los Padres National Forest in Santa Barbara County, California on the Sisquoc River system including Manzana Creek and other tributaries. Specifically, the areas treated will be on the main stem of the Sisquoc River and its tributaries including Foresters Leap Canyon, Manzana Creek, and tributaries from the headwaters on the east to the Forest boundary on the west (approximately two miles west of Manzana Camp). Tamarisk (also known as salt cedar) is a deciduous shrub or small tree from Eurasia; thus it loses its leaves each year, making it difficult to observe during the period when it has no leaves. Tamarisk has a deep, extensive root system. Mature tamarisk plants are able to reproduce from roots. Flowering branches are mostly primary or secondary branches. Each plant can produce as many as 500,000 seeds annually and can produce seeds throughout the growing season. High stress induced by fire, drought, herbicides, or cutting can increase flowering and seed production. The seeds are dispersed by wind and water. Seeds are small with a tuft of hair attached to one end enabling them to float long distances by wind and water. Seeds are shortlived and do not form a persistent seed bank. However, they can germinate within 24 hours of dispersal, sometimes while still floating on water. Seeds produced during the summer remain viable for 24 to 45 days. Winter longevity is approximately 130 days. Seed mortality is generally due to desiccation. If seeds are not germinated during the summer that they are dispersed, almost none germinate the following spring (http://www.fs.fed.us/database/feis/plants/tree/tamspp/). Tamarix trees on floodplains can be difficult to kill, requiring several treatments. The root systems of trees on floodplains are more extensively developed near the ground surface, due to repeated scouring and removal of limbs by floods, and can send up shoots where none existed at the time of initial treatment.